Happy, happy! It’s time for another Creative + Mindful book report! Wheeeee! 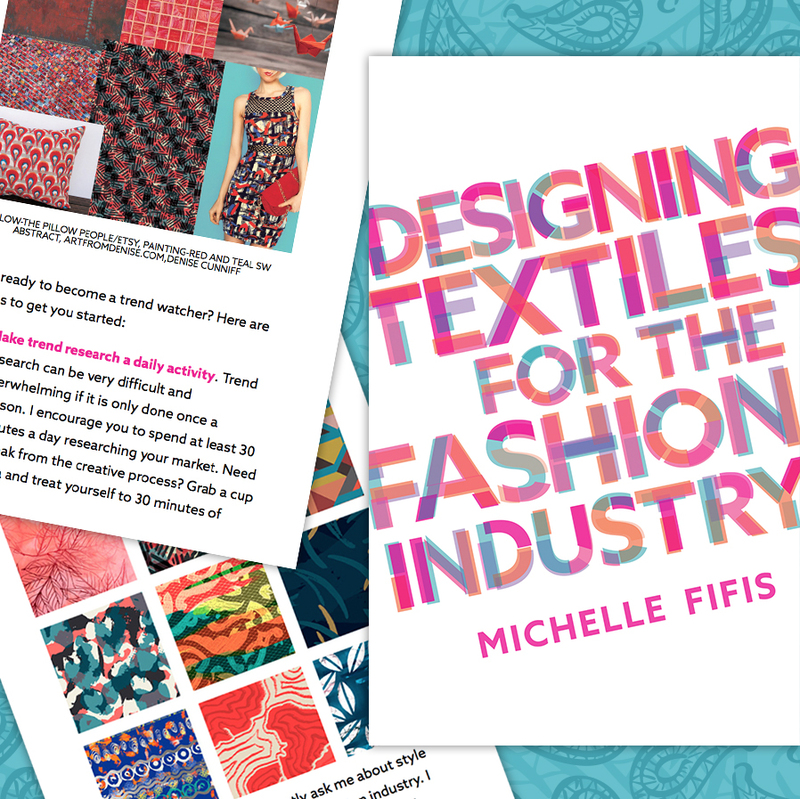 This time around, I have had the pleasure of reading and reviewing an advance copy of Michelle Fifis’ book Designing Textiles for the Fashion Industry. As a dabbler in surface design and a long time member of Michelle’s Pattern Observer mailing list, I was thrilled when she asked me to join her launch team. The book is available as a super-affordable e-book directly on the Pattern Observer site and also as a Kindle edition on Amazon. Textile and surface design has become a much sought after career in the last few years. Many artists (myself included!) love the idea of being able to see their designs come to life in the retail fashion setting through licensing. Wouldn’t it be amazing to see your work adorning the racks of a popular clothing brand? Humans have a special connection with the clothes we wear. We express our personalities with the outfits we assemble each morning. Designing textiles for the fashion industry is an opportunity to help others showcase their style through their apparel. Michelle has written a wonderful primer on what it’s like to be a fashion industry textile designer. My own surface design dabbling has been focused on quilting/sewing fabric design and I was intrigued to learn the differences between designing for that niche versus creating work for the clothing industry. The book covers color, trends, types of layouts, scale, pattern collections, life cycle of a design, and methods of getting your work seen by manufacturers. Michelle addresses these topics by highlighting what is critical to designing specifically for apparel. Insider photos of the manufacturing process are also included in the book. I found the manufacturing section to be particularly fascinating, especially how the design and production life cycle works in relation to the seasonal needs of the apparel industry. I give it an A!